Our new paper details the controversial election changes that have been made since last year’s Shelby County ruling weakened a core provision of the Voting Rights Act. One year ago, the U.S. Supreme Court gutted the most powerful provision in the Voting Rights Act of 1965 — a law widely regarded as the most effective piece of civil rights legislation in American history. Specifically, in Shelby County v. Holder, the Court invalidated the formula that determined which states and localities, because of a history of discrimination, had to seek federal “preclearance,” or approval, from either the Department of Justice or a federal court before implementing any changes to their voting laws and procedures. For nearly 50 years, preclearance (set forth in Section 5 of the Voting Rights Act) assured that voting changes were transparent, vetted, and fair to all voters. Before the Shelby County decision, the Brennan Center examined the potential consequences of a ruling against the preclearance process in If Section 5 Falls: New Voting Implications. In just the year since Shelby County, most of the feared consequences have come to pass — including attempts to: revive voting changes that were blocked as discriminatory, move forward with voting changes previously deterred, and implement new discriminatory voting restrictions. This paper summarizes some of the stories behind these facts, and tracks the voting changes that have been implemented in the states and other jurisdictions formerly covered by Section 5: Alabama, Alaska, Arizona, Georgia, Louisiana, Mississippi, South Carolina, Texas, and Virginia in their entirety; and parts of California, Florida, Michigan, New York, North Carolina, and South Dakota. Section 5 was a uniquely effective law that blocked or otherwise prevented scores of discriminatory voting changes from being implemented. While the Shelby County decision argued that the law was effectively obsolete, Section 5 remained a powerful tool through June 2013. In the 15 years before its operation was halted, Section 5 blocked 86 laws through its administrative process and several more through litigation. At least 13 of these laws were blocked in just the final 18 months before the Shelby Court’s ruling. Its effectiveness went beyond the laws it blocked. In one recent six-year period, 262 voting changes were withdrawn or altered after the Department of Justice (DOJ) asked the jurisdictions for more information to assess whether they were discriminatory under the Voting Rights Act (VRA). That figure does not include the hundreds of voting changes that were deterred because jurisdictions knew they would not withstand VRA review. Texas: On the very day of the Shelby County ruling, Texas officials announced they would implement the state’s strict photo ID law, which was previously blocked by Section 5 because of its racial impact. “[U]ndisputed… evidence demonstrates that racial minorities in Texas are disproportionately likely to live in poverty, and [that the ID law] will weigh more heavily on the poor,” a federal court held. Early assessments indicated that between 600,000 and 800,000 registered voters in Texas lacked photo ID, over 300,000 of them Latino. Voter advocates, including the Brennan Center and the DOJ, have now sued the state of Texas over this law under Section 2 of the Voting Rights Act, among other claims. North Carolina: Also shortly after the Shelby County decision, the state legislature passed a law that imposed a strict photo ID requirement, significantly cut back on early voting, and reduced the window for voter registration. This law is widely regarded as the most restrictive piece of voting legislation passed in recent years. Lawmakers waited until after preclearance was gone to move forward with the legislation, with a State Senate committee chair telling the press after the Court’s decision, “now we can go with the full bill,” rather than a pared down, less restrictive version. Prior to Shelby County, the legislation, which is currently being challenged under Section 2 of the VRA, among other claims, would have required preclearance review before going into effect. Data shows the law will disproportionately affect minorities. In North Carolina, the State Board of Elections identified more than 300,000 registered voters who lack a DMV-issued ID, the most common form of ID accepted under the state’s strict law. One-third of these voters are African American. And 7 in 10 African Americans who cast ballots in 2008 used the early voting period (23 percent of whom did so during the week that was cut by the law). Alabama: After the Shelby County decision, the state moved ahead with its law requiring strict photo ID to vote. This law passed in 2011 and would have required preclearance. However, state officials never submitted the bill for preclearance and did not announce plans for implementation until after the Supreme Court’s ruling. More than 30 percent of Alabama’s voting-age citizens live more than 10 miles from the nearest state-ID issuing office. According to a Brennan Center study, in 2012, 11 counties with substantial black populations had state driver’s licenses offices that were open only once or twice per week. Even those looking to register to vote in Alabama will experience challenges — legislators also passed a law requiring individuals to provide documentary proof of citizenship when registering to vote. This measure is not currently in effect. Mississippi: Shortly following the Supreme Court’s ruling, state officials moved to enforce its photo ID law, which the state submitted for preclearance but was never allowed to implement. Nearly 35 percent of the state’s voting-age population lives more than 10 miles from the nearest office that will issue ID and, in 2012, 13 contiguous counties with sizable African-American populations lacked a single full-time driver’s license office. In 2013, Florida officials attempted to purge thousands of people from the state’s voter’s rolls because of suspicions they were non-citizens. The state ultimately suspended these efforts. When it tried the same thing in 2012, its purge list began with 180,000 suspected non-citizens on the voter rolls and was reduced to approximately 2,700. That purge list contained a disproportionately high number of Latino surnames. While Latinos compose 13 percent of Florida’s registered voters, an analysis found they made up 58 percent of that group of approximately 2,700. From the 180,000 to fewer than 3,000, Florida eventually found fewer than 40 non-citizens suspected of voting illegally. Also in 2013, Virginia officials sought to purge the names of tens of thousands of voters from the state’s rolls. While a federal court allowed the purge to proceed, the state’s efforts were error-prone and taken unnecessarily close to that year’s elections. One month before the election, one county registrar found that of a list of 1,000 names he was told to purge, more than 170 were in error. Arizona officials have proposed implementing separate voter registration systems for federal and state elections. The U.S. Supreme Court ruled last year that Arizona cannot ask for documentary proof of citizenship when voters sign up using the federal registration form. State officials then devised a two-tiered system that would allow the state to require proof of citizenship documents for anyone registering to vote in a state election. The Department of Justice has previously used Section 5 to block such dual registration systems. In 2013, Galveston County, Texas, revived a redistricting plan for electing justices of the peace that was previously blocked by the DOJ because it discriminated against minority voters. The new map diminished minority voting strength by reducing the number districts where minority voters would have a fair and effective voice.The Justice Department blocked a similar proposal under Section 5 only two years ago out of concern that “minority voters possess the ability to elect candidates of choice.” Now, without Section 5’s protections, the districts are slated to be implemented in 2015, but are being challenged in an ongoing case in federal court in the Southern District of Texas. The case went to trial this spring and is awaiting a decision. The city of Pasadena, Texas, is redrawing its city council districts in a way that is expected to diminish the influence of its Latino voters in municipal government. A functioning Section 5 would have blocked any new redistricting plan that would have made it harder for Latinos to elect their candidates of choice. After Shelby County, Georgia officials moved the dates of municipal elections in two counties with substantial African American populations from the traditional November date to another date. This may reduce black voter participation in local elections because the municipal elections are not occurring when citizens are voting in state and federal general elections. The DOJ blocked a similar proposal under Section 5 in 2012 because turnout is lower outside of November elections, and the drop in turnout is “significantly greater” for black voters than white voters. After a federal court dismissed a challenge to the new date for one of the counties, municipal elections took place in May 2014. Data as to minority participation is not yet available for that election, but overall turnout in that county was down nearly 20 percent (30.02 percent in 2014) from the previous mayoral election (49.54 percent turnout in 2010). In 2013 and 2014, at least 10 of the 15 states that had been covered in whole or in part by Section 5 introduced new restrictive legislation that would make it harder for minority voters to cast a ballot. These have passed in two states: Virginia (stricter photo ID requirement and increased restrictions on third-party voter registration) and North Carolina (the above-discussed omnibus bill, which included the ID requirement, early voting cutbacks, and the elimination of same-day voter registration). Further, seven other formerly covered states also passed restrictive legislation in 2011 and 2012, prior to the Shelby County decision. As described above, under Section 5, discriminatory voting laws could not go into effect unless they were vetted through the preclearance process, which consisted of either an effective administrative process or through litigation before a federal court. The jurisdiction had the choice of which preclearance route to take, and the vast majority of preclearance actions were done through the administrative process because it was cheaper, faster, and easier than preclearance litigation. Consider Texas, where state lawmakers passed one of the country’s most restrictive photo ID laws. That law did not and could not go into effect unless and until it was precleared by the DOJ or a three-judge federal court. In this instance, Texas first sought preclearance from the DOJ, but then eventually elected to litigate the matter before a federal court. Both the DOJ and the court denied preclearance, finding the restrictive photo ID requirement violated Section 5. After the Shelby County decision, Texas put the previously blocked law into effect, and it remains so until voters can win a new lawsuit under another provision of the VRA, Section 2, making a similar showing, albeit under a different legal standard. The photo ID law has been in place for local elections and the March 2014 primaries. The case is currently scheduled to go to trial before the 2014 election. Challenging restrictive laws one by one under Section 2 or some other law is considerably more expensive than the administrative preclearance process these individual challenges now have to replace. The active Texas photo ID suit, which is a number of consolidated lawsuits, now lists more than 50 counsel of record on all sides. In the months since that litigation began, the parties have produced more than 300 court filings, including motions, notices, and briefs, large and small. The consolidated North Carolina lawsuits include 40 counsel of record and have filed more than 120 documents. The total cost of these lawsuits will be substantial. As a point of reference, three lawyers who participated in the Texas photo ID preclearance case in 2012 sought more than $350,000 in attorneys’ fees to cover their expenses. The expenses for the active Texas photo ID litigation can expect to run into the millions. Section 5 used to cover more than 8,000 state and local jurisdictions. That is gone now, and it is a large loss. In 2012, the final full calendar year before the Shelby County decision, the Justice Department received 18,146 election law and procedure changes from Section 5 jurisdictions. From 2009 to 2013, the DOJ received 58,692 such changes. One of the statute’s most important functions was to impose transparency on these many thousands of election law changes. For example, the preclearance process included the possibility of input from the public, who could consult with the DOJ during its review or weigh in during any preclearance litigation before a court. Because covered jurisdictions had to provide notice to the DOJ whenever they made a change to their voting systems, there was also a centralized method to monitor those changes before they were implemented. The public benefited from that accountability. Without Section 5, thousands of changes to voting procedures may go unnoticed. While advocates and community leaders remain vigilant and are working to build monitoring systems, Section 5’s mandate to centralize information for thousands upon thousands of voting law changes will be very difficult to replicate. Public notice by election officials and constant awareness by community members may well keep the public informed to a certain extent, but no ad hoc method of learning about incidents will adequately replace a tool with considerable coverage. Section 5 protected voting rights by regulating, deterring, and blocking harmful voting law changes for nearly 50 years. The above information speaks to the fact that it remained active well after its enactment in 1965, and the continued existence of harmful, discriminatory voting laws rebuts the Supreme Court’s claim that progress has made the statute obsolete. For all the real progress Section 5 facilitated, the nation and its voters now lack a critical tool to protect those earned advances. Bad laws with lasting, harmful consequences now lack a review mechanism, the method of fighting these laws is now limited to costly and time-intensive litigation, and the public has lost the one centralized means to track the thousands of changes annually that affect Americans’ right to vote. The year since Shelby County tells only the beginning of a story, but even that beginning points to the tools and accountability that have been lost, and the necessity that our lawmakers recover them. This is the number of submissions of voting changes from the beginning of 1998 to which DOJ has interposed an objection. Some objections were later withdrawn or were superseded by a declaratory judgment action for court preclearance in the U.S. District Court for the District of Columbia. For state-by-state chronological listings of Section 5 objections, see Section 5 Objection Letters, U.S. Dept. of Justice, http://www.justice.gov/crt/records/vot/obj_letters/index.php (listing 86 objections since the beginning of 1998). See, e.g., Florida v. United States, 885 F. Supp. 2d 299, 357 (D.D.C. 2012) (denying preclearance for reduction in early voting opportunities but granting preclearance for procedures for inter-county movers); Texas v. Holder, 888 F. Supp. 2d 113, 144 (D.D.C. 2012) (denying preclearance for Texas voter photo ID law); Texas v. United States, 887 F. Supp. 2d 133, 178 (D.D.C. 2012) (denying preclearance for Texas’s redistricting plans). Supra notes 1 and 2. This is the number of objections interposed from the beginning of 2012 through the date of the Shelby County decision, combined with the preclearance litigation described in note 2. Myrna Pérez & Vishal Agraharkar, If Section 5 Falls: New Voting Implications 5 (2013) (citing Luis Ricardo Fraga & Maria Lizet Ocampo, More Information Requests and the Deterrent Effect of Section 5 of the Voting Rights Act, in Voting Rights Act Reauthorization of 2006: Perspectives on Democracy, Participation, and Power, 47, 57-58 (Ana Henderson ed., 2007), available at http://www.law.berkeley.edu/files/ch_3_fraga_ocampo_3-9-07.pdf. Ed Pilkington, Texas Rushes Ahead with Voter ID Law after Supreme Court Decision, The Guardian (June 25, 2013), http://www.theguardian.com/world/2013/jun/25/texas-voter-id-supreme-court-decision. Texas v. Holder, 888 F. Supp. 113, 127 (D.D.C. 2012), available at http://www.brennancenter.org/sites/default/files/legacy/Democracy/VRE/340%20Opinion%20Denying%20States%20Request%20for%20a%20Declaratory%20Judgment.pdf. Letter from Thomas E. Perez, Assistant Att’y Gen., to Keith Ingraham, Director of Elections, Office of the Texas Secretary of State (Mar. 12, 2012), available at http://www.justice.gov/crt/records/vot/obj_letters/letters/TX/l_120312.pdf. Laura Leslie, NC Voter ID Bill Moving Ahead With Supreme Court Ruling, WRAL.com (June 25, 2013), http://www.wral.com/nc-senator-voter-id-bill-moving-ahead-with-ruling/12591669/. North Carolina State Board of Elections, April 2013 SBOE-DMV ID Analysis 9 (April 17, 2013), available at http://canons.sog.unc.edu/wp-content/uploads/2013/12/St-Bd-voter-ID-report.pdf. Compl., United States v. North Carolina, No. 13-861 (M.D.N.C. Sept. 30, 2013), available at http://www.justice.gov/iso/opa/resources/646201393013723793555.pdf. Kim Chandler, State Has Yet to Seek Preclearance of Photo Voter ID Law Approved in 2011, AL.com (June 12, 2013), http://blog.al.com/wire/2013/06/photo_voter_id.html. Kim Chandler, Alabama Photo Voter ID Law to be Used in 2014, State Officials Say, AL.com (June 26, 2013), http://blog.al.com/wire/2013/06/alabama_photo_voter_id_law_to.html. 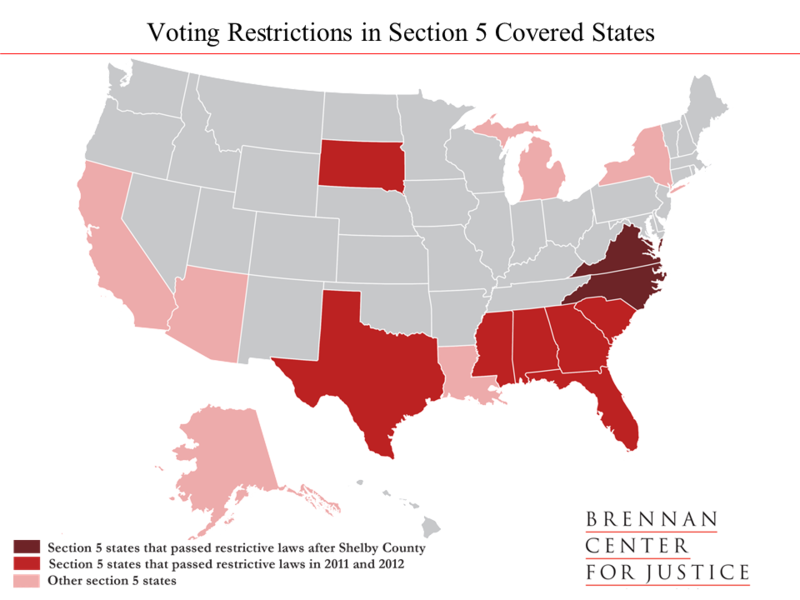 Keesha Gaskins & Sundeep Iyer, The Challenge of Obtaining Photo Identification, Brennan Center for Justice, at 7, available at http://www.brennancenter.org/sites/default/files/legacy/Democracy/VRE/Challenge_of_Obtaining_Voter_ID.pdf. Letter from Delbert Hosemann, Mississippi Secretary of State, to T. Christian Herren, Jr., U.S. Dept. of Justice (Jan. 18, 2013), available at http://sos.ms.gov/links/voter_id/Cover%20letter.pdf. See Voting Determination Letters for Mississippi, U.S. Dept. of Justice, available at http://www.justice.gov/crt/records/vot/obj_letters/state_letters.php?state=ms (listing no objection letter as to Mississippi’s ID law). Gaskins & Iyer, supra note 14, at 3 (Table 1). See Steve Bousquet & Michael Van Sickler, Governor to Launch New Purge of Florida Voter Rolls, Miami Herald (Aug. 4, 2013), http://www.miamiherald.com/2013/08/04/3538862/governor-to-launch-new-purge-of.html; Amy Sherman, Many Questions, Few Answers on State’s Voter Purge Plan, Miami Herald, (Oct. 9, 2013), http://www.miamiherald.com/2013/10/09/3680007/many-questions-few-answers-on.html. Steve Bousquet & Amy Sherman, Florida Halts Purge of Noncitizens from Voter Rolls, Tampa Bay Times, (Mar. 27, 2014), http://www.tampabay.com/news/politics/elections/florida-halts-purge-of-noncitizens-from-voter-rolls/2172206. Lizette Alvarez, Ruling Revives Florida Review of Voting Rolls, N.Y. Times, (Aug. 7, 2013), http://www.nytimes.com/2013/08/08/us/ruling-revives-florida-review-of-voting-rolls.html?_r=0. Marc Caputo, Feds to Florida: Halt Non-Citizen Voter Purge, Miami Herald, (May 31, 2012), http://www.miamiherald.com/2012/05/31/2826708/feds-demand-florida-cease-its.html. Lizette Alvarez, Ruling Revives Florida Review of Voting Rolls, N.Y. Times (Aug. 7, 2013), http://www.nytimes.com/2013/08/08/us/ruling-revives-florida-review-of-voting-rolls.html; Rachel Weiner, Florida’s Voter Purge Explained, Wash. Post (June 18, 2012), http://www.washingtonpost.com/blogs/the-fix/post/floridas-voter-purge-explained/2012/06/18/gJQAhvcNlV_blog.html. Matt Zapotosky, Virginia’s Democratic Party loses challenge against purge of 38,000 voters from rolls, Wash. Post (Oct. 18, 2013), http://www.washingtonpost.com/local/virginia-politics/federal-judge-rejects-democratic-challenge-to-virginia-voter-roll-purge/2013/10/18/26235068-3809-11e3-8a0e-4e2cf80831fc_story.html. See Jonathan Brater, Virginia Offers Lessons for Voter List Maintenance, Brennan Center for Justice (Nov. 25, 2013), http://www.brennancenter.org/analysis/virginia-offers-lessons-voter-list-maintenance see also Virginia Removes 40K From Voter Rolls Over Democrats’ Objections, Associated Press (Oct. 17, 2013), http://www.timesdispatch.com/news/state-regional/va-removes-k-from-voter-rolls-over-democrats-objections/article_2d111de4-49de-523b-bd9c-5d93b7c0a00e.html. Jim Nolan, Chesterfield registrar delays purge of voter rolls, Richmond Times-Dispatch (Oct. 9, 2013), http://www.timesdispatch.com/news/local/chesterfield/chesterfield-registrar-delays-purge-of-voter-rolls/article_162e36b5-0be7-5dc8-af9f-48876a167b43.html. Arizona v. Inter-Tribal Council of Arizona, 133 S. Ct. 2247 (2013). Ariz. Op. Att’y Gen. No. I13-011 (Oct. 7, 2013); see Cindy Carcamo, Arizona officials say rule may keep thousands from voting, L.A. Times (Oct. 8, 2013), http://articles.latimes.com/2013/oct/08/nation/la-na-ff-arizona-voting-20131009. See Letter from Sandra M. Shelson, Special Assistant Att’y Gen., U.S. Dept. of Justice, to State of Mississippi (Sept. 22, 1997), available at http://www.justice.gov/crt/records/vot/obj_letters/letters/MS/MS-2650.pdf (denying preclearance for a two-tier system, noting that “a similar requirement had led to pronounced discriminatory effects on black voters”). See Young v. Fordice, 520 U.S. 273, 275 (1997) (holding that Mississippi needed to seek preclearance for its proposed change to a two-tier system). See Section 5 Objection Letters, Dept. of Justice, available at http://www.justice.gov/crt/records/vot/obj_letters/index.php. Unfortunately, because of the loss of Section 5’s notice requirement, it is difficult to learn of voting changes at the local level, which typically are not as high profile as the state-level changes. While some local voting changes have come to light, many others (like polling place closures, local election cancellations, and the like) are undoubtedly undiscovered. Galveston County, Tex., Redistricting Order Establishing Justice of the Peace Precinct Boundaries (Aug. 19, 2013), available at http://www.guidrynews.com/13August/23113GalvestonCo.pdf. See also Harvey Rice, Lawsuit says Galveston remap discriminatory, Houston Chronicle (Aug. 26, 2013), http://www.houstonchronicle.com/news/houston-texas/texas/article/Lawsuit-says-Galveston-remap-discriminatory-4761878.php (paywall only). Annette Baird, Candidates compete for fewer Galveston County justices of peace positions, Houston Chronicle (Feb. 18, 2014), http://www.chron.com/neighborhood/bayarea/news/article/Candidates-compete-for-fewer-Galveston-County-5245671.php. Petteway, et al. v. Galveston County, Texas, et al., No. 3:13-cv-308 (S.D. Tex. Aug. 26, 2013). Sylvia Garcia & Larry Peacock, Garcia, Peacock: Redistricting proposal targets Hispanic gains, Houston Chronicle (Nov. 1, 2013), http://www.chron.com/opinion/outlook/article/Garcia-Peacock-Redistricting-proposal-targets-4947300.php. Letter from Thomas E. Perez, Assistant Att’y Gen., to Dennis R. Dunn, Deputy Att’y Gen., State of Georgia (Dec. 21, 2012), available at http://www.justice.gov/crt/records/vot/obj_letters/letters/GA/l_121221.pdf. Sandy Hodson, City Wins Lawsuit over Change in Election Date for Local Offices, The Augusta Chronicle (May 13, 2004), http://chronicle.augusta.com/news/government/elections/2014-05-13/city-wins-lawsuit-over-change-election-date-local-offices; Maggie Lee, Macon-Bibb Legislators React After Tuesday Wins, The Telegraph (Macon, Ga.) (May 21, 2014), http://www.macon.com/2014/05/21/3109205/macon-bibb-legislators-react-after.html?sp=/99/148/198/415/. Table of Voter Turnout in General Primary/General Nonpartisan/Special Election (May 20, 2014), Georgia Secretary of State, available at http://results.enr.clarityelections.com/GA/51345/132192/en/vt_data.html. Augusta-Richmond County General Election Results 2010, Augusta-Richmond County Board of Elections, available at http://appweb.augustaga.gov/board_elections/voter/electab10ge/totals.asp?RaceID=310. Some private plaintiffs also raised constitutional and state law claims, which could also be a basis for striking down the law. See Ortiz, et al. v. State of Texas, No. 2:13-cv-00348 (S.D. Tex. Nov. 5, 2013), ECF No. 1. The Ortiz suit has been consolidated with other challenges to the Texas ID law. Order, Veasey v. Perry, No. 2:13-cv-193 (S.D. Tex., Jan. 10, 2014), available at http://moritzlaw.osu.edu/electionlaw/litigation/documents/Consolidating.pdf (granting motion to consolidate cases). See Notice of Pending Matters and Submission of Proposed Orders at 8-10, Veasey v. Perry, No. 2:13-cv-193 (S.D. Tex., June 4, 2014), available at http://moritzlaw.osu.edu/electionlaw/litigation/documents/Veasey3441.pdf. See Joint Status Report Regarding Defs.’ and the State Legislators’ Doc. Produc. at 4-7, N.C. State Conference of the NAACP, et al. v. McCrory, No. 1:13-cv-658 (M.D.N.C. May 22, 2014), available at http://moritzlaw.osu.edu/electionlaw/litigation/documents/League168.pdf (listing counsel of record). See Kennie Def.-Intervenors’ Mot. For Att’ys’ Fees, Expenses, and Costs With Supporting P. & A. at 27, Texas v. Holder, No. 1:12-cv-00128 (D.D.C. Sept. 10, 2013), ECF No. 130. U.S. Dept. of Justice, Section Five Changes by Type and Year, http://www.justice.gov/crt/about/vot/sec_5/changes_10s.php.